Your days of wondering about the very narrowly defined early life of Dr. Hannibal Lecter will be over sooner than expected, as NBC’s anxiety-laden spring full of screaming sacrificial lambs has led them to visit the cannibal psychiatrist. 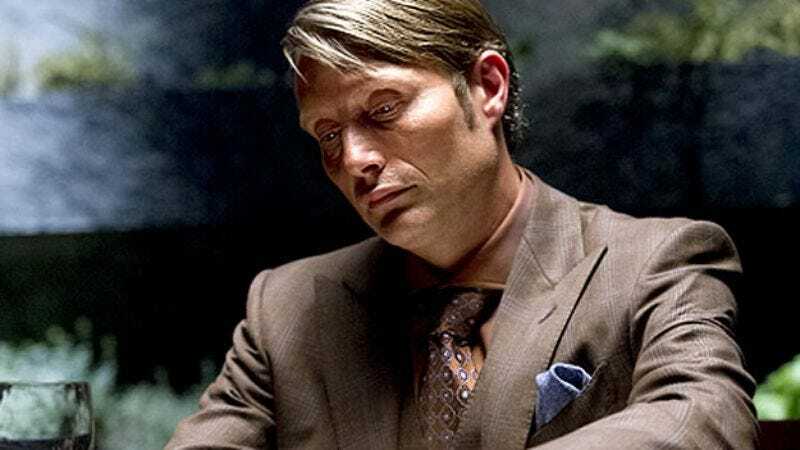 Bryan Fuller’s Hannibal is now set for an April 4 premiere in the Thursday 10 p.m. slot recently vacated by Do No Harm—another loose literary adaptation about another doctor leading an evil double life. Of course, Do No Harm lacked both Hannibal’s impressive cast and the promise of people eating people, so maybe this one will do better. As a reminder, Hannibal stars Mads Mikkelsen as the youngish Lecter, Hugh Dancy as his FBI pal Will Graham, and Laurence Fishburne as their supervisor who doesn’t go in for any of these people-eating shenanigans, plus the promise of Gillian Anderson, Eddie Izzard, Anna Chlumsky, Molly Shannon, Gina Torres, Caroline Dhavernas, and Kids In The Hall’s Scott Thompson in days and possibly meals to come. And as another, quid pro quo reminder, just about every NBC drama that premieres in this time slot gets its liver eaten by its competitors. But then, desperate times call for desperate measures—like becoming buddy cops with a cannibal, or casting the only new drama you have down into the well of a death-trap time slot, hoping it doesn't get the hose again.